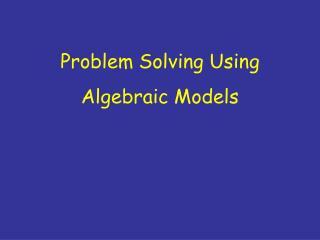 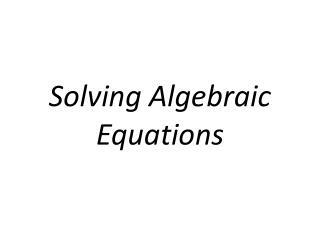 Problem Solving Using Algebraic Models. 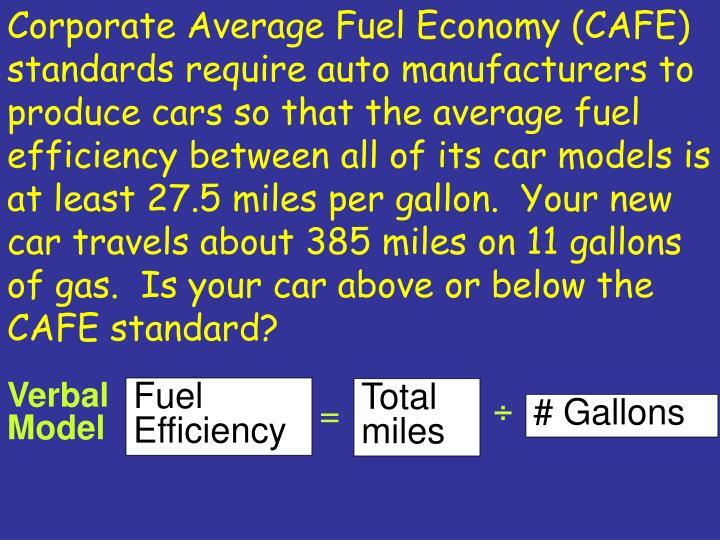 Corporate Average Fuel Economy (CAFE) standards require auto manufacturers to produce cars so that the average fuel efficiency between all of its car models is at least 27.5 miles per gallon. 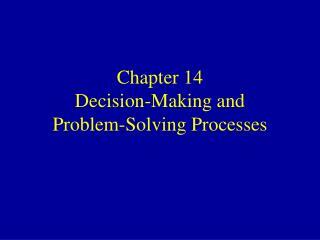 Your new car travels about 385 miles on 11 gallons of gas. 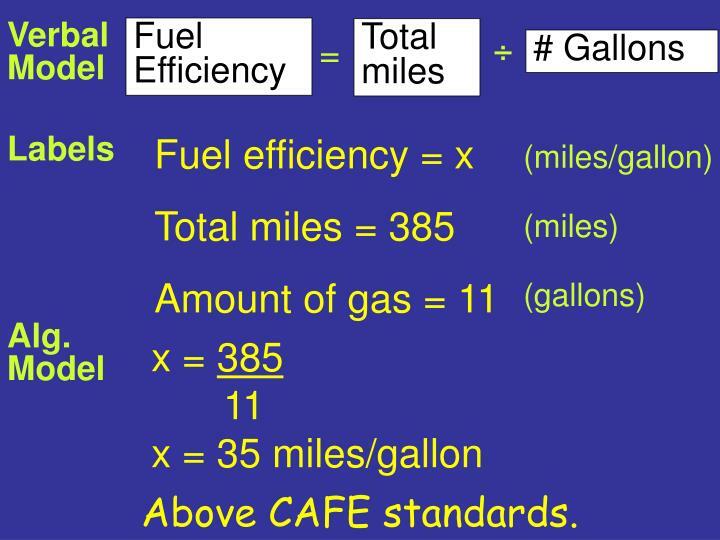 Is your car above or below the CAFE standard? 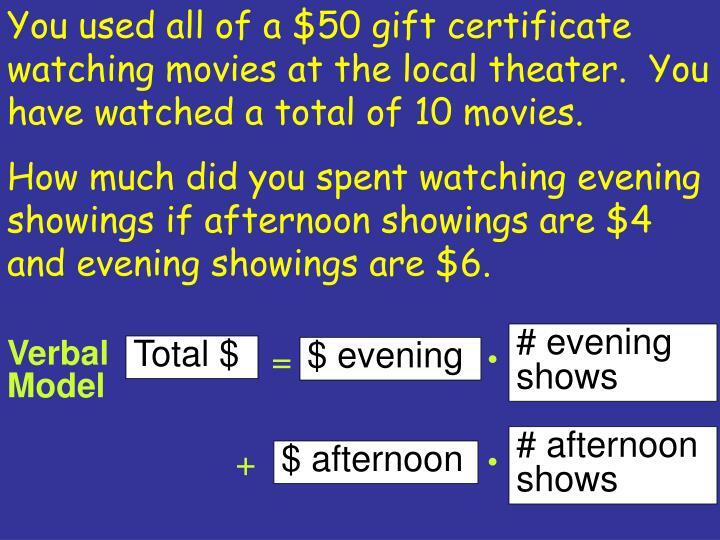 You used all of a $50 gift certificate watching movies at the local theater. 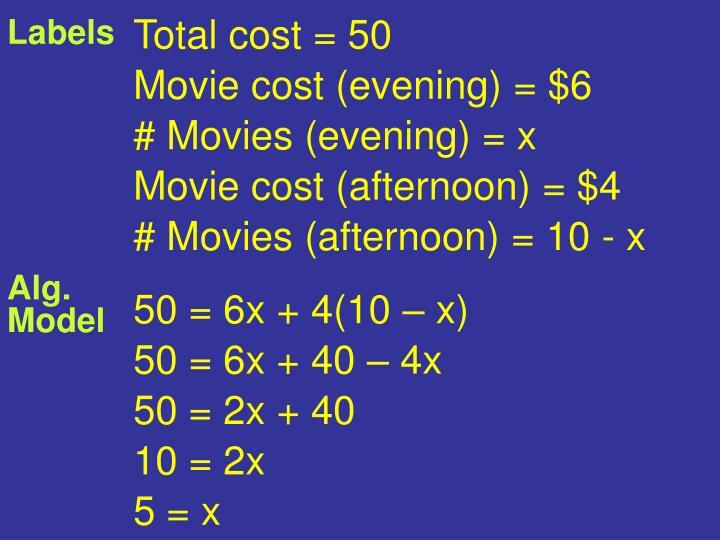 You have watched a total of 10 movies. 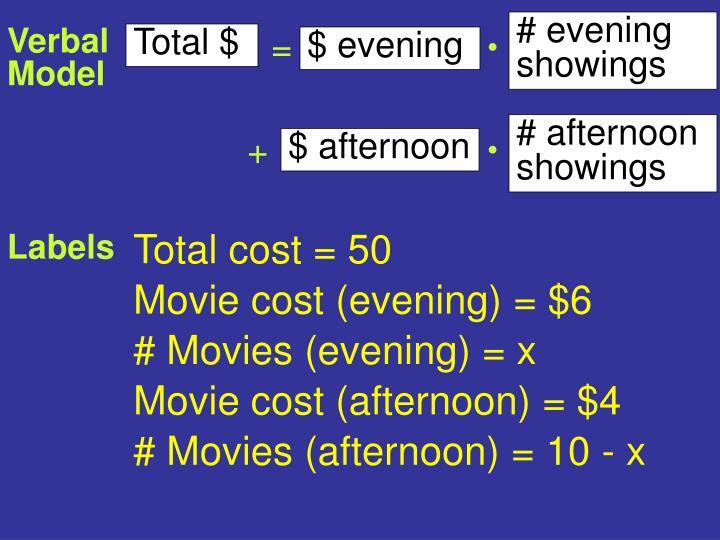 How much did you spent watching evening showings if afternoon showings are $4 and evening showings are $6. 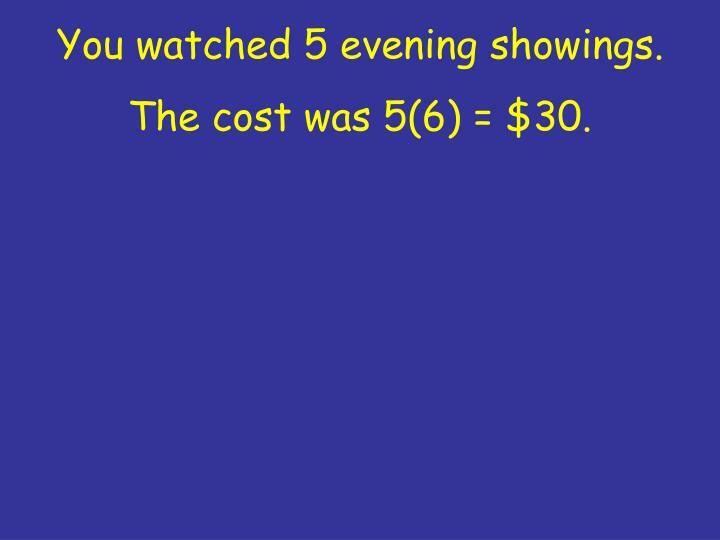 You watched 5 evening showings. 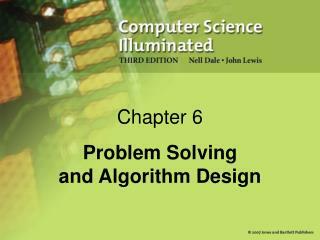 The cost was 5(6) = $30. 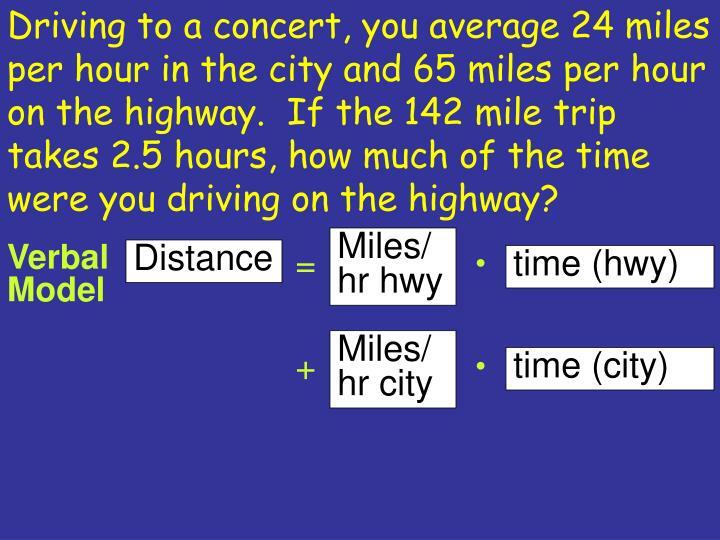 Driving to a concert, you average 24 miles per hour in the city and 65 miles per hour on the highway. 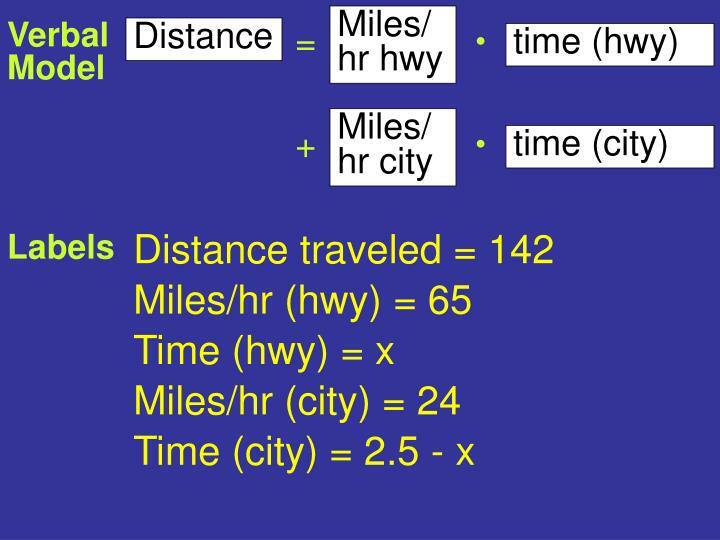 If the 142 mile trip takes 2.5 hours, how much of the time were you driving on the highway? 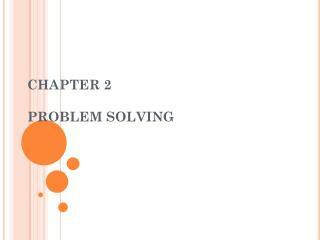 2.5 – 2 = ½ hour. 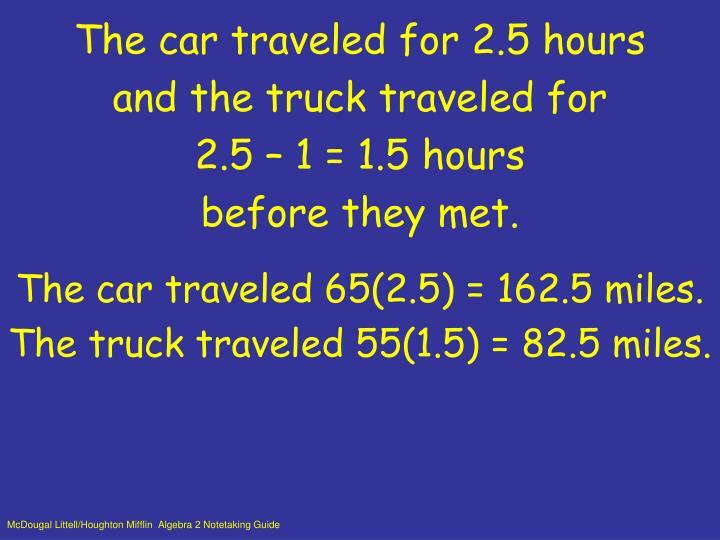 A car and a truck are 245 miles apart traveling towards each other until they meet. 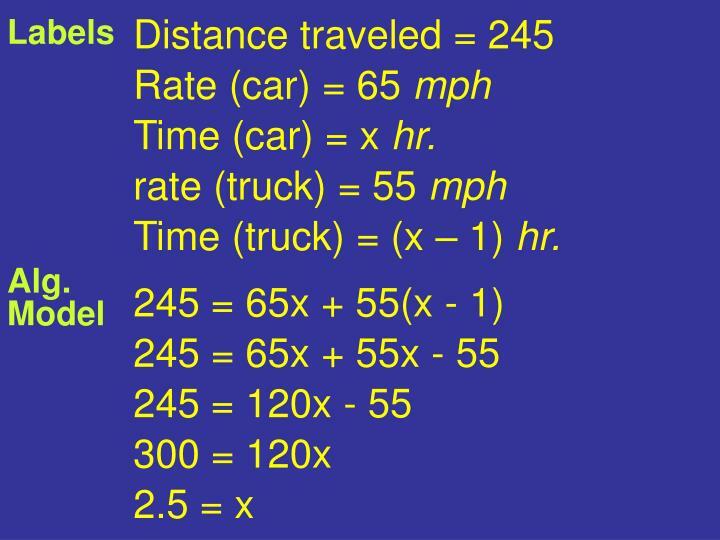 The car averages 65 miles per hour and the truck averages 55 miles per hour. 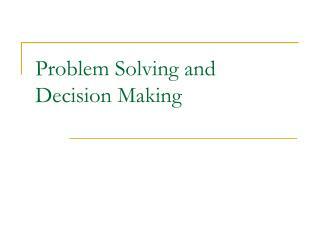 The truck started one hour after the car. 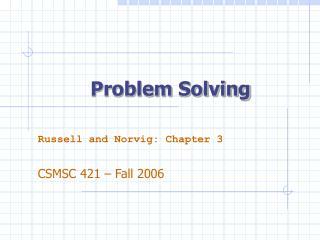 After how long do the two automobiles meet? 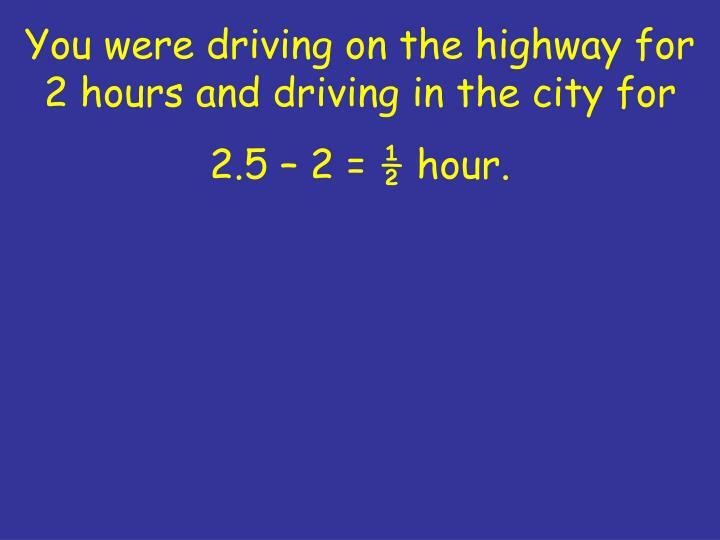 How many miles did each automobile travel? 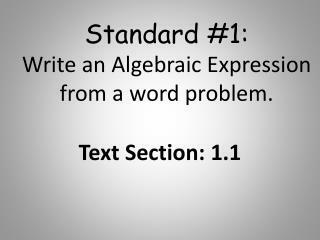 Time (car) = x hr. 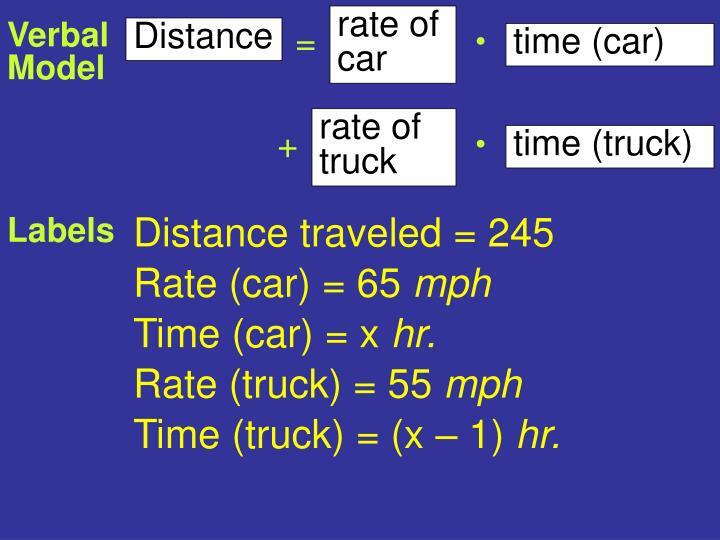 Time (truck) = (x – 1) hr. 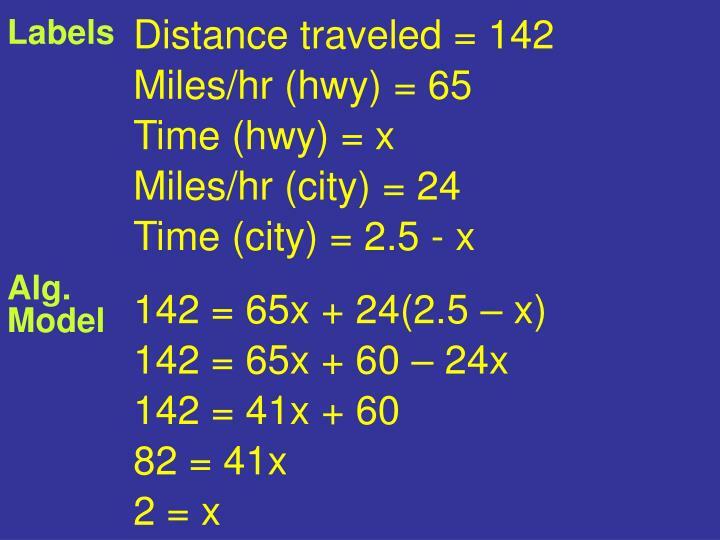 The car traveled 65(2.5) = 162.5 miles. 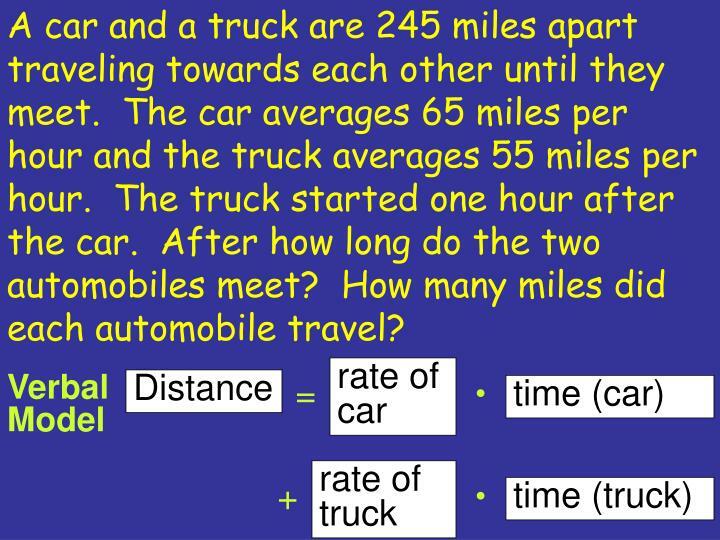 The truck traveled 55(1.5) = 82.5 miles. 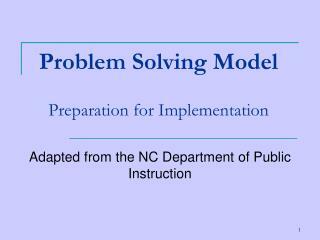 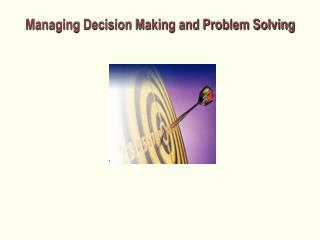 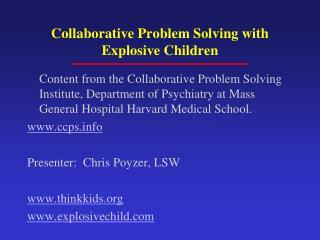 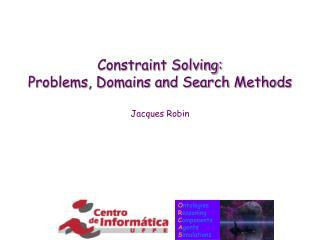 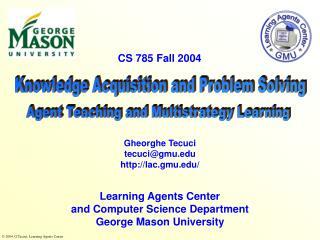 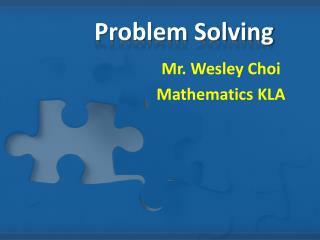 Implementing the Problem-Solving/Response to Intervention -. 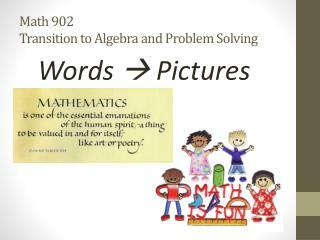 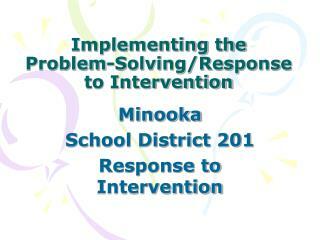 minooka school district 201 response to intervention. 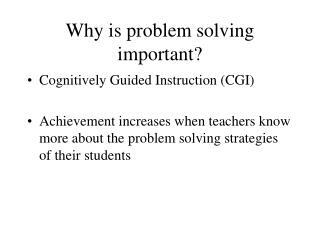 if we can really understand the problem, the answer will come out of it, because the answer is not separate from the problem. 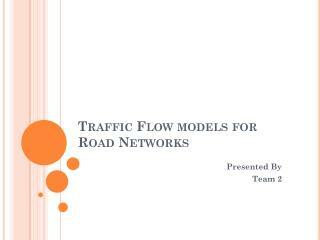 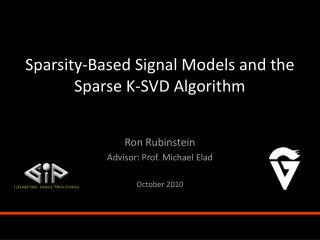 Traffic Flow models for Road Networks -. 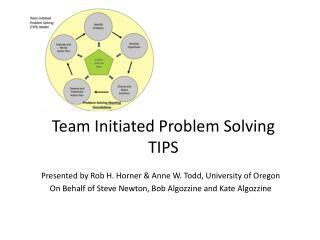 presented by team 2. outline. 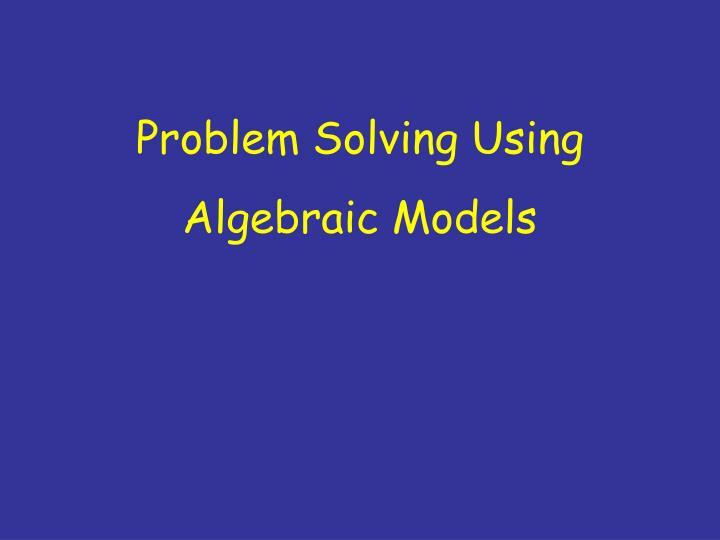 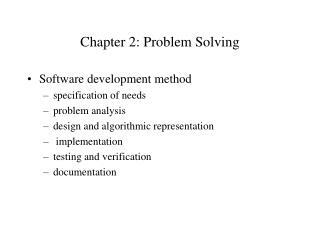 motivation introduction problem statement classification related work microscopic models macroscopic models mesoscopic models comparison future work conclusion.